Believer, God chose you, for a purpose. He has a plan for you to fulfill for Him. You aren’t just here for no reason. You aren’t just biding time until Christ returns or you go to heaven. God has good works He wants you to do. He has appointed you to bear fruit that will last and bring Him glory. He sent His Son Jesus to earth with a purpose and a plan, and Jesus fulfilled it. That purpose and plan was to bring redemption for you, so you could be brought into the Kingdom of God, but also that you would do God’s work here on earth. 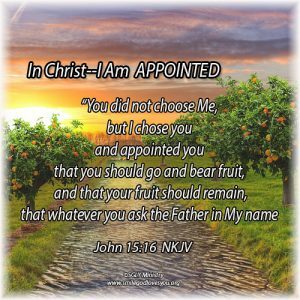 So, rejoice that the God of the Universe has chosen you to do His work and then go forth daily asking Him what He wants you to do for Him so that you can bear fruit that lasts. And remember, you can whatever He asks you to do, because in Christ you are Able to do all things, you have His strength and you are All Sufficient, Abounding in grace, and therefore Abundant in good works. Live daily in His plan and purpose, bearing fruit, and bringing Him glory! I guarantee you it will be an amazing journey and you will have a full and joyous life !